News of this movie coming out polarized moviegoers. Primary responses were “that’s stupid!” or “that’s awesome!” The movie is based on a book by author Seth-Grahame Smith, an author known for literary and historical “rewrites” that insert mythical characters into beloved stories. His first was “Pride and Prejudice and Zombies”, which, last I heard, is in development as a movie as well. Personally, I was looking forward to this film. I’m eager to read the book, because I’ve been told that it is a seriously good piece of literature, deeper than anyone would’ve expected, using vampires and action as a device to present in a unique way the plight of the slaves and the “stakes” of the Civil War and the Emancipation Proclamation. Unfortunately, the movie only caught glimpses of this. It’s a catch 22, really. In choosing the director they did, it was unlikely the movie was going to be anything but style over substance. But, the action scenes were incredible. In the hands of a different director, we may have gotten a better movie, but the action scenes would probably have been less of escapist fun. 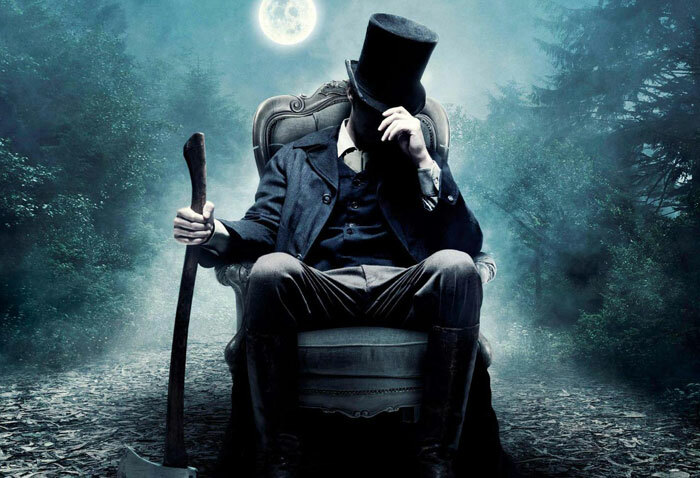 It is a rare director indeed that can do both well, and with material titled “Abraham Lincoln: Vampire Hunter”, I doubt many of those directors would want to be involved. That being said, the movie we got was the movie we got, and it wasn’t as good as it could’ve been. But nonetheless, there are some brief, interesting things to be said about it theologically. First, there is a lot of biblical imagery in the movie. The primary means of killing vampires in this movie is through the use of silver. Silver is cursed by God, according to this movie, because of Judas’ betrayal of Jesus for pieces of silver. If I cared more about this post, I would do research on vampire myth. This is not the first appearance of the “silver” as a weapon against vampires. Other movies show that vampires can not touch those with a cross necklace. (Also something about garlic? Not sure about the imagery there.) What’s interesting is that this movie takes the story of Abraham Lincoln and inserts vampires as the driving force in his life and the perpetrators of major historical events, and does a good job of making it credible. But the whole vampire mythos supposes that vampires fit within a Judeo-Christian story as well. The question becomes, is that credible? I leave this question to you, and would love it if we could all discuss it in the comments. But so that this post isn’t completely phoned in, I will reflect on a particularly thought-provoking line toward the end of the movie. This means, of course, SPOILERS. The final scene of the movie occurs as Lincoln is about to leave for the theatre (to his death, as only the audience knows). The vampire that trained him to kill vampires offers Lincoln immortality, by turning him into a vampire as well, saying that “they could fight side by side as a team for eternity. Lincoln, having accomplished so much great change through his life, replies that “Vampires aren’t the only thing that live forever”. This is a deeply profound reflection on what is referred to in the Bible as “eternal life”. It is part of the Christian view, and indeed part of Jesus’ teaching, that following Jesus leads to eternal life. And it is an ancient Jewish belief that after death, there is Resurrection and judgment before God. One thing I have come to believe over the last five years or so is that while the ideas of eternal life and life after death are related, and I believe are both true, they are NOT actually the same thing. Jesus’ proclamation was that the kingdom of God is both coming and here now. To enter into eternal life is not to die and go to heaven. Eternal life is not simply about an extension of life, but an entirely different kind of life begun now that continues on after death. Part of participating in the kingdom of God, then, is participating in those ideas and concepts of God that go on forever as well, like freedom, love, justice, and peace. This is what it means for God’s kingdom to come “on earth as it is in heaven”. We are the conduits by which heaven takes hold of earth and shapes it to look more like what God intended all along. Lincoln, in real life and in this movie, participated in the bringing about of freedom for the oppressed, an extension of his love for all of God’s creation. By doing so, Lincoln participated in the kingdom of God because he found something that was really true, lasting, and eternal, and helped bring it to life. This is the idea of incarnation, that one can put skin and flesh on ideas like love that mean nothing without embodiment. An underlying assumption of Lincoln’s quote in this movie is something Christians often neglect: it deeply matters what we do here. The Bible simply does not support a worldview that says life on earth is simply a “waiting room” for heaven. This is lowest and most common form of escapism. And really, why would we wait for heaven later if we can experience it now, and do we really deserve heaven later if we don’t want it for everyone else now? Lincoln’s legacy is such that the world will never be the same because of the good that he did. We can say, theologically, that Lincoln participated in the kingdom of God by making the earth a little more like heaven. And we ought to strive for the same. John 3:16 says that Christ has come that all who believe in him may have eternal life. Let us be reminded that eternal life is about both quantity and quality, and may we, like the crazy ax-wielding vampire hunter, find ways to facilitate the coming of God’s kingdom on earth as it is in heaven… though hopefully with less violent, crazy ax-wielding means.